Acrylic, 30″ x 36″ $1400. Iris are my favorite personal flowers. 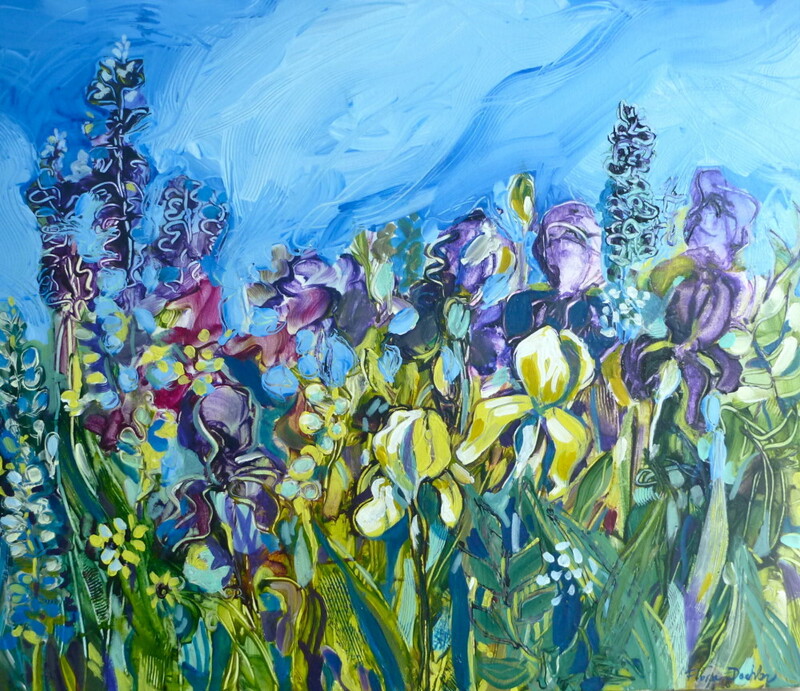 The iris in this painting came from blooms in my grandmother’s garden in Toronto over 60 years ago. I paint them every year and think of my mother and grandmother. My paintings always reflect my state of mine. 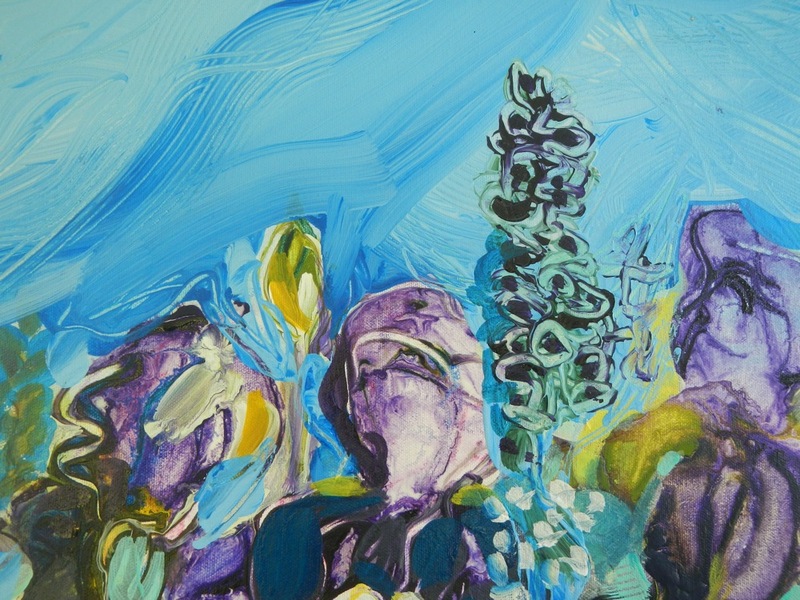 While I worked on this, I brooded about a problem in my non-painting life that turned this into a very purple and blue painting. 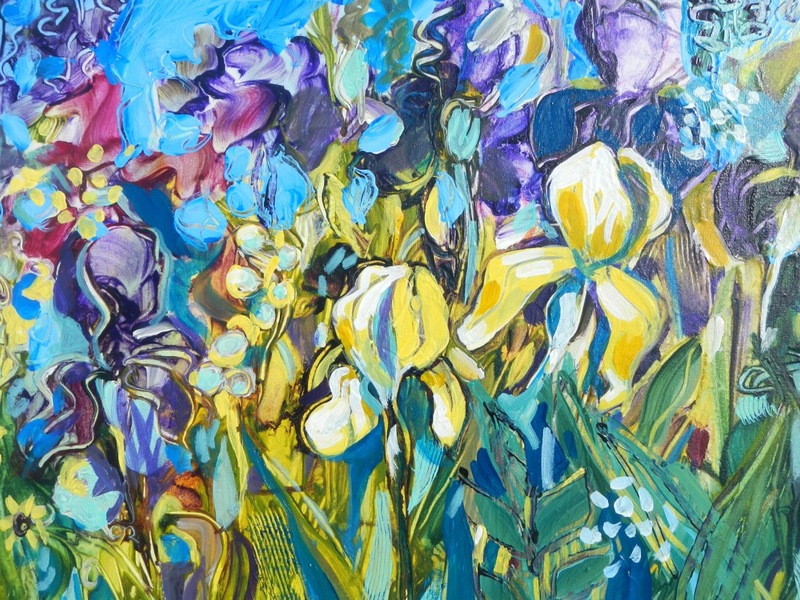 But as the week wore on I changed my way of seeing my problem and that’s when I (coincidentally) changed the focal point in the painting to an optimistic yellow iris. 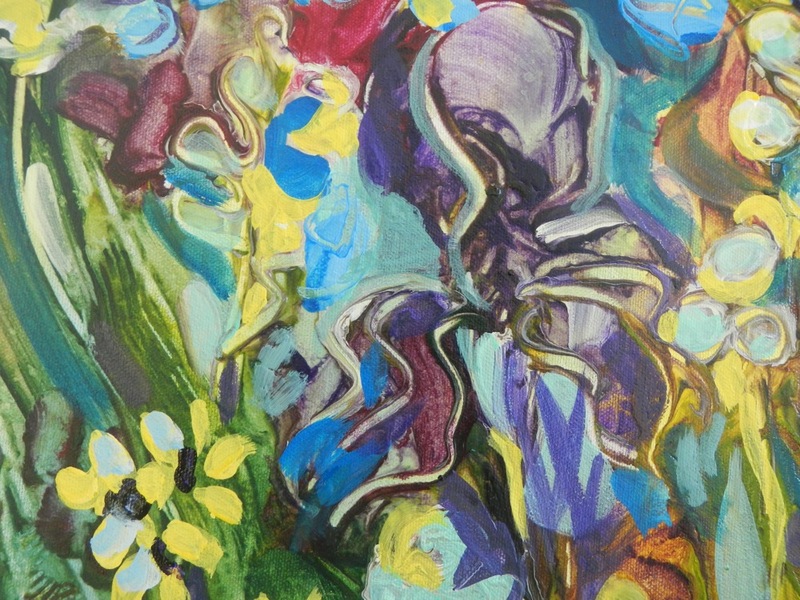 I started this painting outdoors in front of my ‘model’, the flower bed. 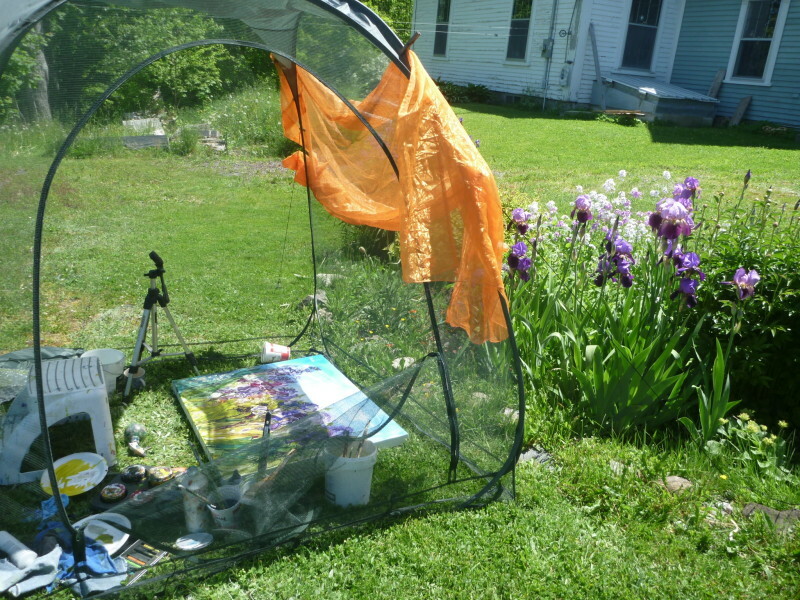 I have a wonderful pop-up screened tent to protect me from vicious black flies, who are out in full force in spring. 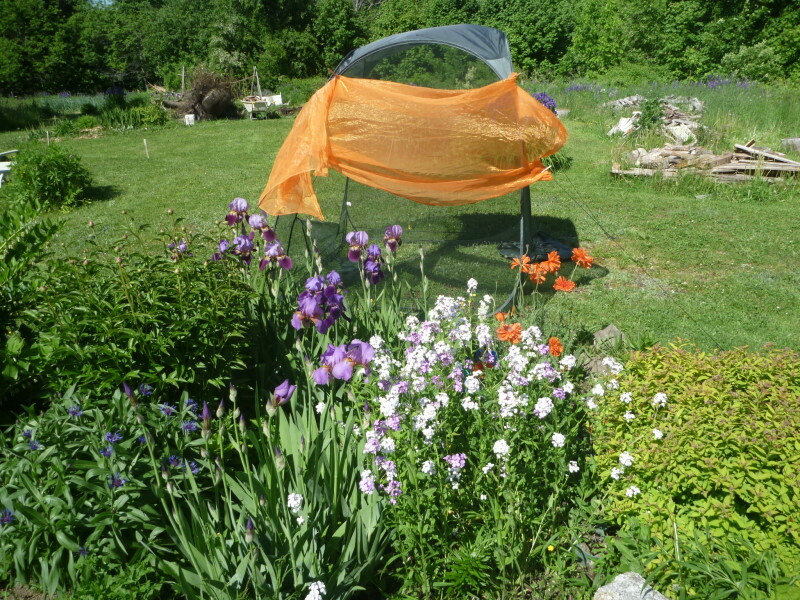 The orange curtain is clothes-pinned to reduce the glare from the direct sun. 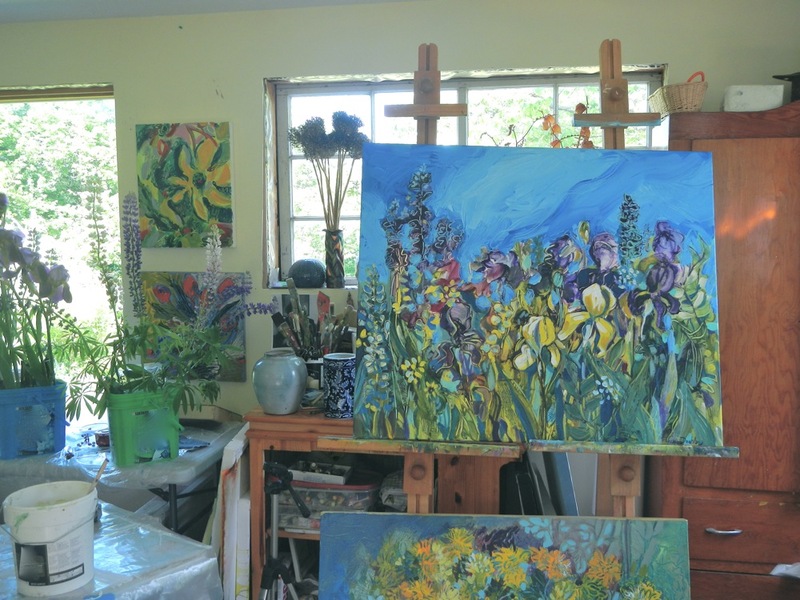 I bring in the work to refine it in the studio…along with some flowers. Here you can get a better sense of the size of the painting. Iris are such glamourous and voluptuous flowers! And you capture it all, plus their/your mood. Tulips are voluptuous,too, but aren’t into frilly ball gowns; they’re more sleek/svelte glamourous. And daisies are just happy-go-lucky kids. I love your portrayals of irises! Wonderful Flora. You’ll have to come paint in Newfoundland…though flowers are only out in July. We are just getting our lilac blooms now! Wow Sharon….imagine how late your growing season is. Sounds like you need a REALLY BIG greenhouse. 😉 Thanks for your comment, and I hope all is well for you and Paul there. Thank you for sharing not only your finished work, but the journey taken to arrive at it. Love getting your “art diary”. Eloise, thank you for your appreciation. I’m glad that you are enjoying some back story, because there always is one and I dooo like to share it. Absolutely beautiful. Love the bold colours. Love the lines. The flowers explode off the canvas. We always look forward to your newsletter. Great stuff. Thank you Graham and Bonnie! Feedback like yours feels pretty good to receive. I hope you continue to enjoy it. 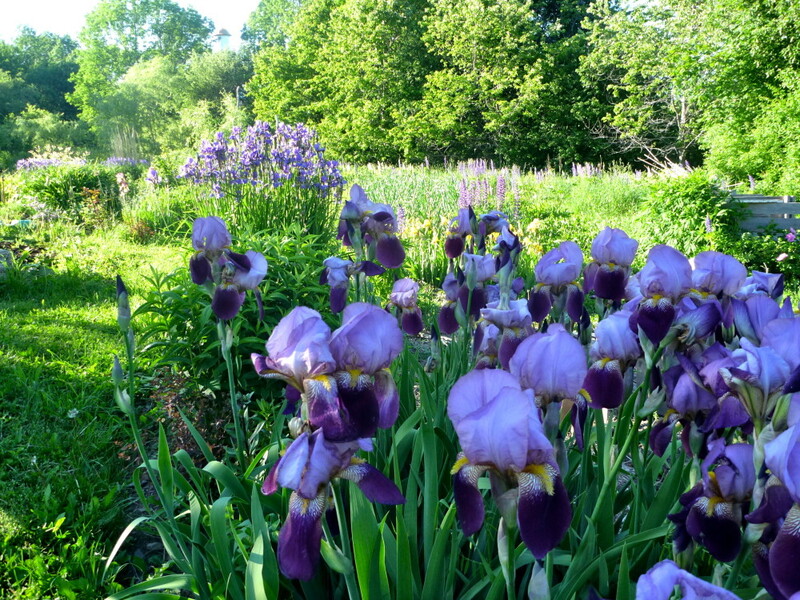 Love your blue “turned yellow” irises and how you got there. Awesome painting. Hi Belle, thank you so much.I enjoy hearing the background story from other artists too. I’m glad you enjoyed hearing mine. Thank you Carol. I try to keep those paintings loose! Awww….Joan I love to hear that. I sure feel joy in the making of them. Thanks for your comment!